My littlest one was sick this week. 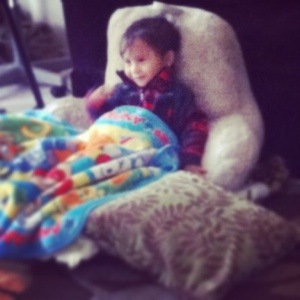 The picture is when he started to feel a bit better, sitting in the cozy and warm “throne” I made him. I’m always busy here at home, often working, which is very difficult when this little guy is in mommy mode. As all you parents know, when a child is not feeling well, he just wants his mommy! Well earlier in the week I was frustrated with this dynamic. I felt bad for him but I was also trying hard I keep up with my schedule. Begrudgingly, I stopped working to nurse him and get him to sleep. I didn’t get any sleep that night, as he kept waking up congested and coughing and crying for milk. I only fell into a deep sleep as the sun was coming up. I must have slept for less than an hour, but the nightmare I had felt longer. I dreamed that somehow when I had Rocky, drugged up during the C section, I had actually had twins, and that my second baby was taken away without me knowing. I was reunited with him in my dream-now a toddler, looking just like Rocky. I’m pretty sure this “twin” thing was just to protect my heart from the heartbreak that was coming. In my dream I was holding him for a bit but had this pulling feeling if needing to get to an audition. (I’m not an actor, but I guess in my dream I was auditioning for something. But the feeling that I had other things I needed to do was the same as in my real life.) As I was pulling away, he pulled my far toward him. I told him, “I love you!” Like I often tell Rocky. I had sill been waiting for him to repeat it. Then this twin clearly said, “I love you, Mama!” I was so happy and I held him. As I held him and was looking at his face, something went wrong. The life left his face. He died in my arms. I started crying so hard, I felt I couldn’t breathe. I cried so hard that I woke up. And in my bed, I’m holding onto Rocky crying and crying. My older two came in and comforted me when I told them a very short version of what I had just experienced, still not fully realizing that it wasn’t my reality. Even as I type this, there are tears flowing from my eyes. After that dream, I spent a lot of time with my sick little guy, lots if hugs and kisses, no frustration wen he wanted to nurse, I spent extra attention to keeping him well fed and baked gluten free brownies and made him some more orange juice. Doting on him, wiping his nose and continuously applying kids Cherry Vapo Rub. I still got work done, but I was reminded that I work from home for my kids, that he’s not in the way of work. Sometimes even the best parents need a reminder of what’s important. By the end of the day, he was feeling tons better, and more than just physically better, I could tell that he was happier and felt more loved. I slept much better that night.